Childcare workers are small business owners, many of whom are women of color serving low-income families out of their homes. Because they have never been unionized or had a voice in establishing state regulations that affect them, this workforce has historically faced intimidation tactics, inadequate regulations and heavy-handed abuses of power. Over the coming days, Council 36 will be visiting the homes of hundreds of childcare workers, particularly those who serve low-income recipients of childcare subsidies from the state. The goal is to build worker power to push Sacramento lawmakers to create equitable and fair regulations and industry standards. On Sunday, Council 36 members and staff participated in a day-long training on the sorts of abuses these workers confront on a daily basis, and how to help drive change. 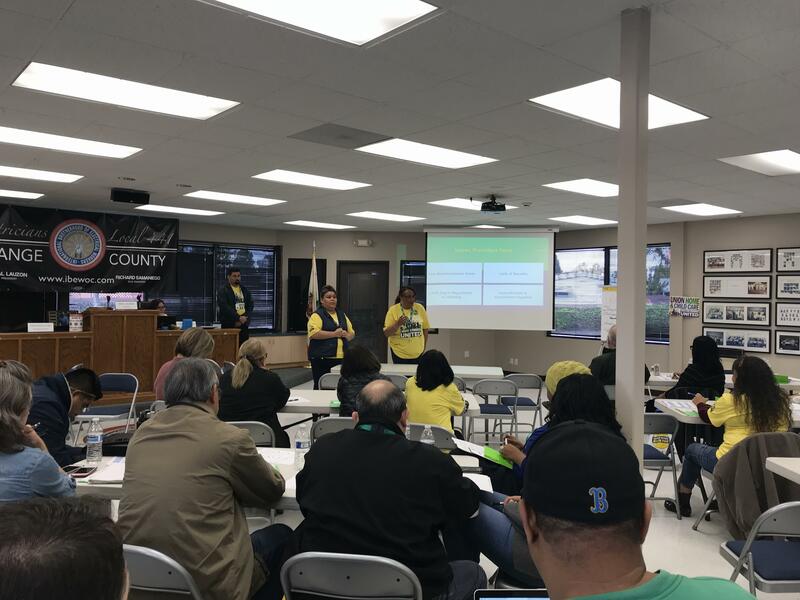 Pictured at right of screen: President of Council 36's Huntington Park Local, Edwin Aragon (far right) volunteers to speak with child care workers, and receives canvassing training from a United Domestic Workers (UDW) staffer at a union hall in Orange County.